In The Amazing Spider-Man 2, the web-slinger finally soars. What sets a great super hero movie apart from the rapidly growing number of riff-raff? The latest entries of Thor and Captain America felt mighty derivative. Even The Avengers, while fun and supremely popular, faltered on its way to saving New York City (again). The bulk of the comic book movies being churned out exhibit a modest sense of fun, but the big budget spectacles are lacking a basic element of humanity that should make them relatable. In his Dark Knight series, Christopher Nolan found the antidote to super hero sameness by grounding the super elements with a fresh dose of reality. The characters felt real, the circumstances of their lives elevated by a dark narrative informed by real-world possibilities. To that end, Captain America: The Winter Soldier turned out to be nothing more than a retake on Nolan’s The Dark Knight Rises. The Dark Knight series was told so well, it’s hard to think of a beat Batman missed. It even started the trend of no opening titles, just the bat logo, an approach copied here with the spider emblem. Has reality set in on the super hero genre? Not the reality of life merging with the Marvel and DC universes, but rather the reality of having already said it all; too many characters, too few fresh ideas. Well, if any sequel had low expectations for the year, it’d be The Amazing Spider-Man 2. Given The Amazing Spider-Man was a laborious reboot that retold a story too well done only 10 years earlier, there wasn’t much reason to get excited about a sequel to a reboot of a modern comic book classic. That said, the most amazing thing about this Amazing Spider-Man is simply how good it really is. The characters - particularly Peter Parker, Gwen Stacy and Aunt May - feel fresh (again). There’s soul. There’s humor. There are themes worth thinking about. The first time Spidey appears on screen, there’s an instant realization that they’ve finally got something right, something crucial to the Spider-Man experience: Spidey swings and dives high above the streets of New York City and he’s enjoying it. The technology is there to finally make his antics realistic and exhilarating. As a bonus, he’s also got his back story out of the way (again) and it’s time to move on to bigger and better. There’s a delightful energy between Peter (Andrew Garfield, The Social Network) and Gwen (Emma Stone, Easy A), no doubt aided by an off-screen romance between the stars. They’re obviously having fun and the chemistry here is even better than that iconic kiss between Peter (Tobey Maguire) and Mary Jane Watson (Kirsten Dunst) in Spider-Man. Peter and Gwen have a lot to juggle - there’s school, photography, romance and that whole city-saving, bad-guy-crushing thing (again) - and perhaps her safety is the one element that will cause them to visit Splitsville. They’ve got the banter and the passion. Their relationship doesn’t feel forced and, given the demise of Gwen’s police officer father in the first installment, Peter’s burdened with a heightened sense of responsibility to her and her family. And that leads to one of this movie’s themes: Time. The value of life and the preciousness of time is highlighted in Gwen’s high school graduation speech. In flashbacks, Peter’s father also comments on the irreplaceable value of time. That all leads to an uncommonly artful climax in a clock tower. To say any more than it’s really well done would be a bad idea. The first installment buckled while simply meeting all the obligations of retelling the Peter Parker/Spider-Man origins story. Martin Sheen’s Uncle Ben fumbled around looking for the wisdom that so eloquently rolled off Cliff Robertson’s tongue. This time, they went back to the classics and pulled out Ralph Waldo Emerson. It is impossible to argue with Ralph Waldo Emerson. Aunt May (Sally Field, Lincoln) attempts to quote him. Gwen channels him in her speech as she advises her fellow students to live their own lives, not the lives of others. Emerson rocks. Another element that sets The Amazing Spider-Man 2 a cut above is that it’s really not about the special guest villain. In this case, that’s definitely a good thing. Jamie Foxx (Ray) is Max Dillon, a nerdy engineer at Oscorp. It is not complimentary to say his introduction has shades of Jim Carrey as Ed Nygma in Batman Forever. While Max is a nerd and hides behind stereotypical thick-rimmed eyeglasses, Foxx isn’t a credible nerd with his stocky, muscular frame. Max has no friends, but he’s mighty talkative. Most people, though, forget about him moments before their conversation ends. Max has a man-crush on Spidey that rushes to new levels after Spidey saves Max’s life. In true comic book fashion, however, Max falls into a tank of electric eels (it’s kinduva long story, just roll with it) and turns into Electro, a power-hungry baddy who, at least initially, just wants to be wanted. That’s the Matt Notes edition of the Max Dillon story. But don’t be distracted. Electro is simply a catalyst to move the story along. And he’s an opportunity to merge the fantastical side of Marvel’s comics with the human condition. Thankfully, elements that could’ve veered into Adam West (or Joel Schumacher) territory by way of Electro’s phenomenally unrealistic situation, condition, existence - his everything - corrects course and this one turns into a smorgasbord of meats and sweets. The focus here is on a larger narrative that works really well. There are patterns of betrayal, between Norman Osborn (Chris Cooper, The Company You Keep) and his son, Harry (Dane DeHaan, Kill Your Darlings) as well as between Norman and Richard Parker (Campbell Scott, Dead Again). Fulfilling Oscorp’s mission to make the world a better place, Norman and Richard were working with spiders in order to find ways to inject self-healing properties into the human system. Spider-Man, in turn, became a by-product of those experiments. Where does this renewed energy come from? Well, it helps to have a slate of new screenwriters on board, new veteran screenwriters, that is. Alex Kurtzman and Roberto Orci (the hit-or-miss duo behind a mind-boggling number of big movies including Transformers, J.J. Abrams’ Star Trek and Mission: Impossible III) along with another J.J. Abrams favorite, Alex Pinkner (TV’s Fringe and Alias), somehow, rather miraculously, revive Spider-Man and return him to superstar status. It seems as though, at least here, in this case, they realize with great power comes great responsibility. The relationships between the characters are better defined this time around. The storied friendship between Peter and Harry is better than in the Sam Raimi series (with James Franco as Harry). And this time Aunt May takes a stand for herself and becomes a character instead of another sweet-old-lady caricature. In Peter’s bedroom, in a stack of books, lies a copy of Infinite Jest, the revered novel by David Foster Wallace that skewers American culture, entertainment and personal identification. That’s a nice, witty touch, a mind-warping melding of the real and the fictional, while also offering a little bit of a wink at the super hero phenomenon. Spidey offers hope that everything’s going to be all right to the movie’s citizens of New York, and to those who watch his adventures light up the big screen. Like the Dark Knight, he’s a symbol designed to inspire people young and old. Consider, then, the little boy Peter rescues from bullies early on, and how this boy figures into the climactic action. 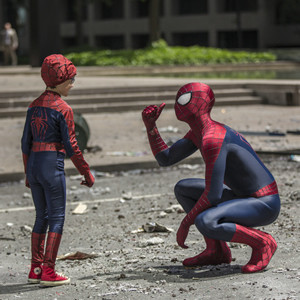 In The Amazing Spider-Man 2, both Peter Parker and that little boy present an opportunity for all to rejuvenate their sense of childhood wonder and remember what it feels like to be a kid (again).